Meet at the Surf the Bay Surf School Van opposite 47 Coronation Drive Broulee at a time negotiated by you and your personalised, highly skilled, ASI qualified, friendly coach. You will work together to develop a plan of attack to meet your individualised needs as a beginner, intermediate or highly skilled surfer. 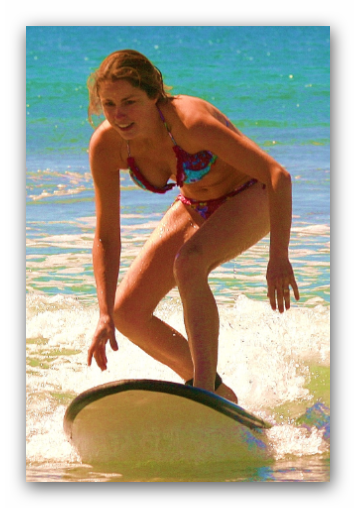 Through exclusive teaching techniques and surf skill analysis you will be aided in developing or improving your existing surfing skills. The private lesson will run for approximately 1.5hrs with over 80% of that time spent in the water and on the board. At Surf the Bay we pride ourselves on providing optimum amount of tuition time in the water to maximise your value for money in private lessons. Whether you need assistance with various alternative standing techniques due to body limitations or you just want to fine tune particular manoeuvres we have the staff and skills to get the job done.